Billy Happel, a member of the Blue Stars in the 1960s and 1970s, sent this picture. 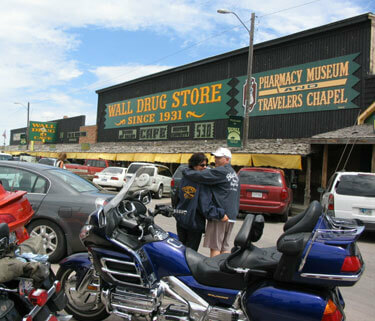 Attached is a picture taken at the famous Wall Drug in South Dakota. Kathy (Troopers 1967-1973), and me (Blue Stars 1965-1974), were traveling from Casper, Wyo., to Mankato, Minn., for a show and stopped by to take a picture with our respective corps jackets on in front of this tourist attraction. The Blue Stars stopped there every year on their way to Drums Along the Rockies in the 1970s. When you see signs for Wall Drug from 300 miles away, you just have to stop and take a look. Kathy and I were reacquainted after 30 years at the 2004 DCI World Championships in Denver. We will be married in September of this year. Kathy is currently serving her first term on the board of directors for the Troopers, and I am the vice president of the board of directors for the Blue Stars.